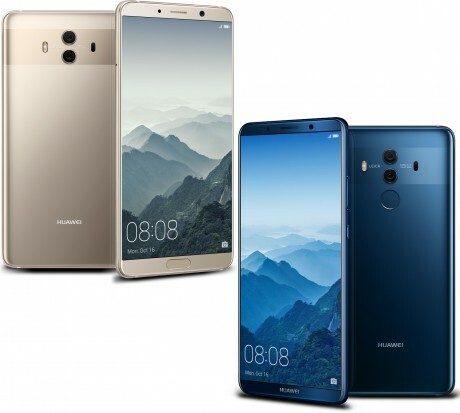 Huawei today announced the Mate 10 and Mate 10 Pro, the Chinese company's flagship smartphones heading into the end of the year. The Mate 10 (left) and Mate 10 Pro (right) are high-end devices with curved glass panels front and back, and a metal frame in between. Huawei created a distinct reflective band that runs across the rear of the phones to call out the cameras. The phones share nearly all features and primarily differ with respect to screen aspect ratio and resolution. Where the Mate 10 has a quad HD 5.9-inch LCD panel with a 16:9 aspect ratio, the Mate 10 Pro has an HD+ 6-inch OLED panel with an 18:9 aspect ratio. The Mate 10's fingerprint reader is located on the front and the phone supports microSD memory cards, where the Mate 10 Pro's fingerprint reader is on the back and the phone doesn't support memory cards. The phones rely on Huawei's new Kirin 970 processor, its homegrown 8-core CPU, which includes a 12-core GPU and dedicated neural network processing unit, or NPU. The NPU is primarily put to use with the camera, where it is able to recognize objects and adjust the camera's parameters accordingly. At launch, the Mate 10 and Mate 10 Pro will, for example, be able to recognize the difference between flowers and plants, or cats and dogs in order to more accurately capture photos. The phones feature a dual-camera system on the back with a 12-megapixel RGB sensor and a 20-megapixel monochrome sensor, both at f/1.6. Some of the tools include scene recognition, bokeh, optical image stabilization, and AI-assisted focusing and zooming. The front camera has an 8-megapixel sensor at f/2.0. The phone will launch with Android 8 Oreo and EMUI 8, a new version of Huawei's Android skin. EMUI 8 was built to take advantage of the Kirin 970 and supports advanced split screen multitasking and a full desktop computing experience sans dock. The Mate 10 and Mate 10 Pro also include 4,000mAh batteries with rapid and wireless charging, NFC, Bluetooth 4.2, GPS, WiFi, high-definition audio, USB-C, and high-speed LTE. The Mate 10 is available only with 4 GB of RAM and 64 GB of storage, while the Mate 10 Pro is available in either a 4 GB / 64 GB or 6 GB / 128 GB configuration. Pricing and availability was not disclosed.